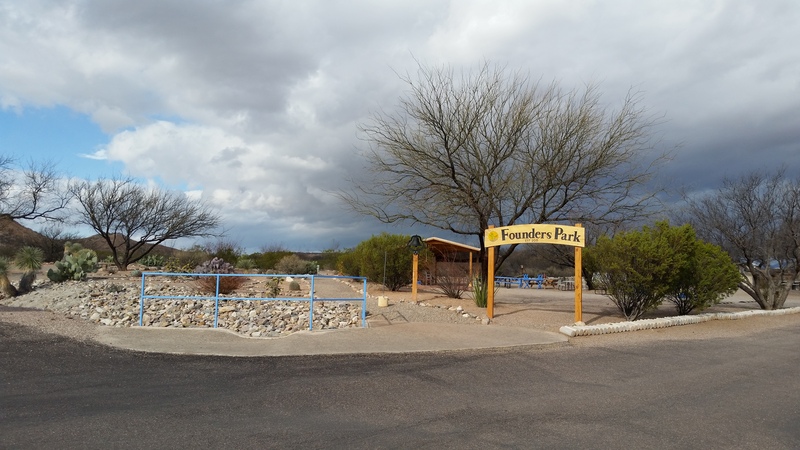 We spent some time in Tucson at two different campgrounds on opposite sides of the city. 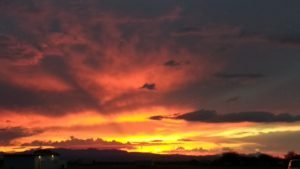 The first two nights we camped at the Pima County Fairgrounds with a few of our friends. We caught up on laundry, groceries and had a good lunch out. 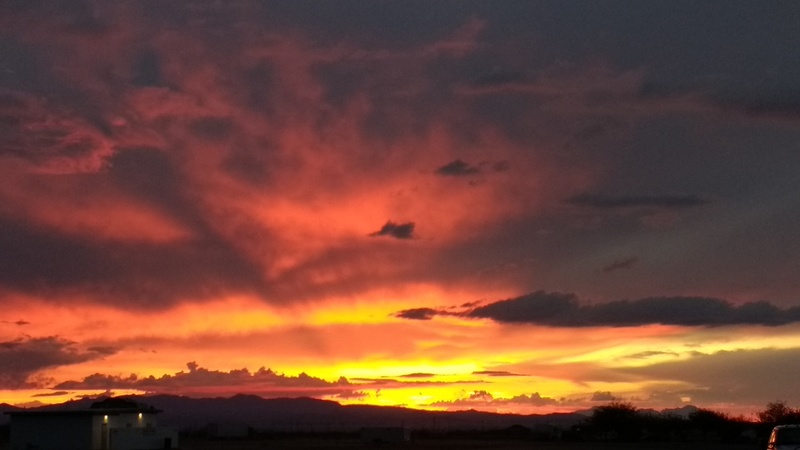 Here is a beautiful sunset we saw at the Pima County Fairgrounds. Next we moved to Gilbert Ray, a county park on the west side of town. From there we visited the Saguaro National Park Visitor center and captured this view from the back of the visitor center. We took the scenic drive through the park. The landscape is beautiful and rugged and much different than Organ Pipe National Monument. 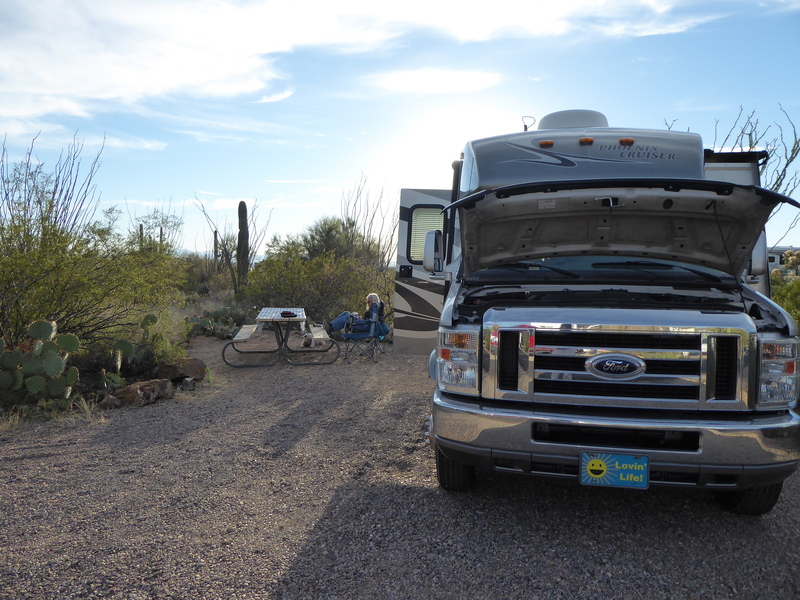 While at Organ Pipe we learned that we should put our hood up every night to prevent pack rats from causing damage. Some people suggested putting a light under the vehicle as well. Tucson is another area that this is recommended. We sustained pack rat damage to our battery insulation even following these suggestions. We went to the Arizona-Sonora Desert Museum in Tucson and our favorite exhibit was the hummingbird aviary. 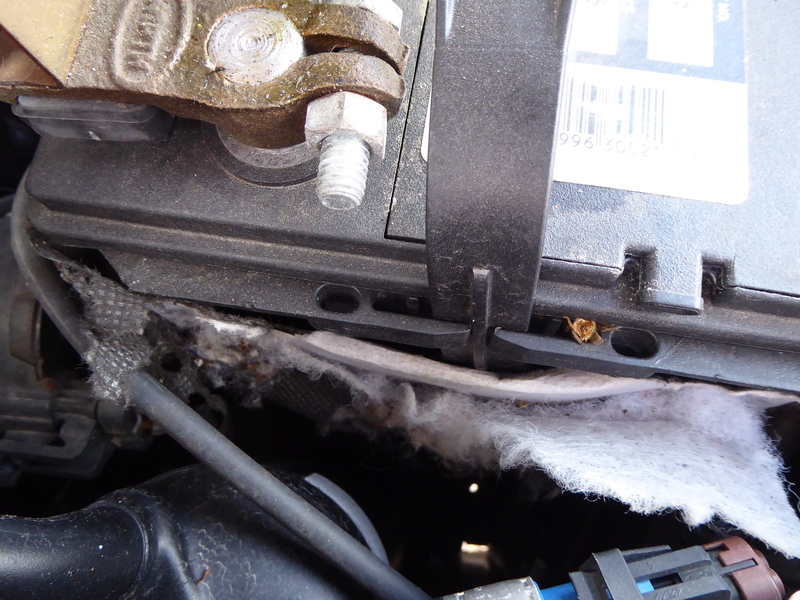 The birds were just starting to nest. 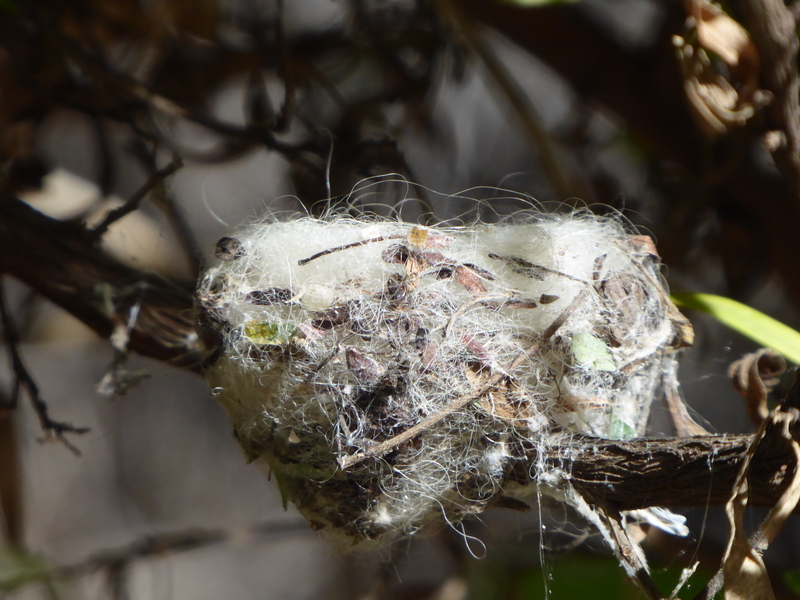 Having never seen a nest before, we were thrilled to see a couple of nests. The park provides dog hair for the birds to make their nest and they also use spider webs. They are quite intricate. 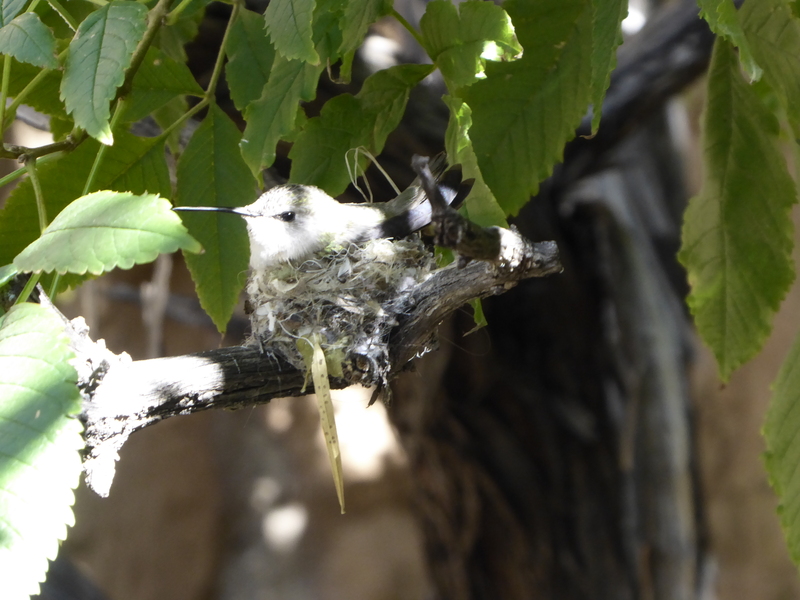 We were able to capture a hummingbird on her nest. Momma sitting on her nest. 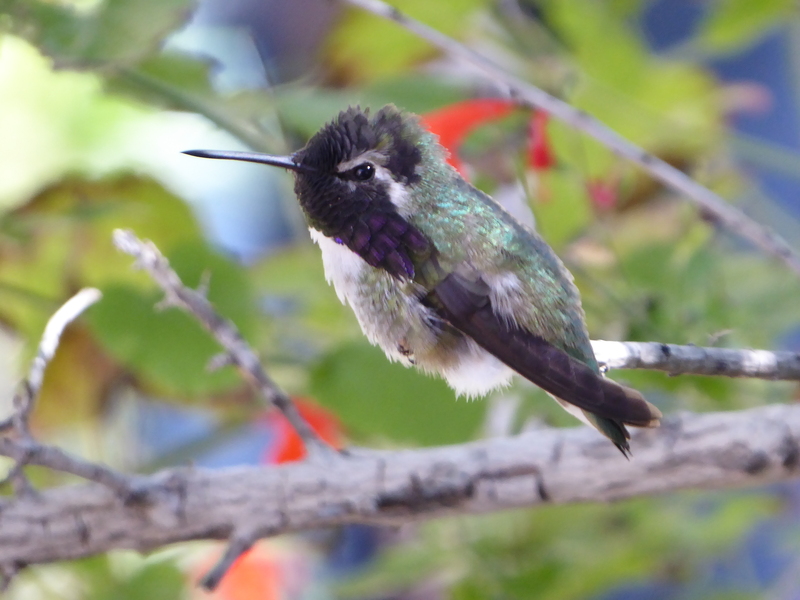 This little bird was very colorful and was fun to watch. He seemed to enjoy the attention. This little guy seemed happy to pose. Upon departing Tucson, we headed to Benson, AZ where we spent two nights. We had joined an RV club called the Escapees before we left for our trip. 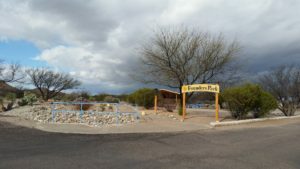 We stayed at the park property with no hookups for $5.00 per night and had use of all the facilities – wifi, showers, clubhouse, etc. The park was full and there was a waiting list to get a site with full hookups. It really wasn’t an inconvenience for us since we were able to run the generator when we needed it. The park was very clean and nicely landscaped. The staff was welcoming and friendly. We did some day trips – the first day we stopped at Tombstone, AZ, an historic western town where Doc Holiday and Wyatt Earp fought in the legendary gunfight at the O.K. Corral. 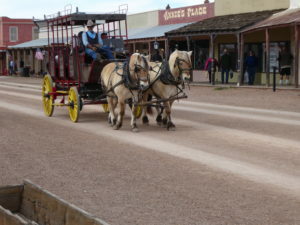 We walked down the streets and were taken back in time as we watched stagecoaches roll down the main street and saw people dressed in the 1800’s era. 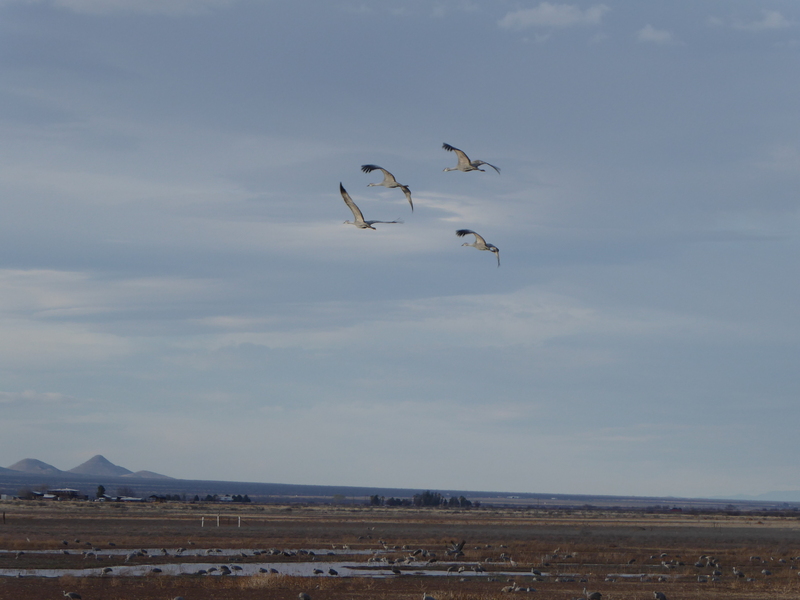 That afternoon we drove to Whitewater Draw Wildlife Area, a former cattle ranch with desert grassland, marshlands and mudflats. 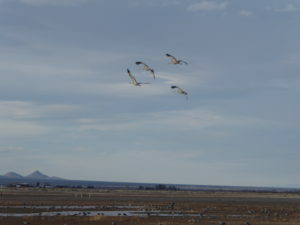 It is a magical place where more than half of Arizona’s Sandhill Cranes migrate for the winter, as many as 20,000 sandhill cranes. 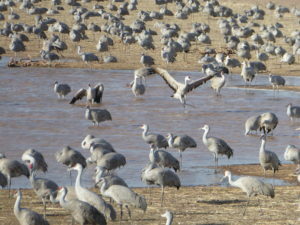 These birds spend the night standing in the shallow waters to evade predators, and then fly out each morning to feed. 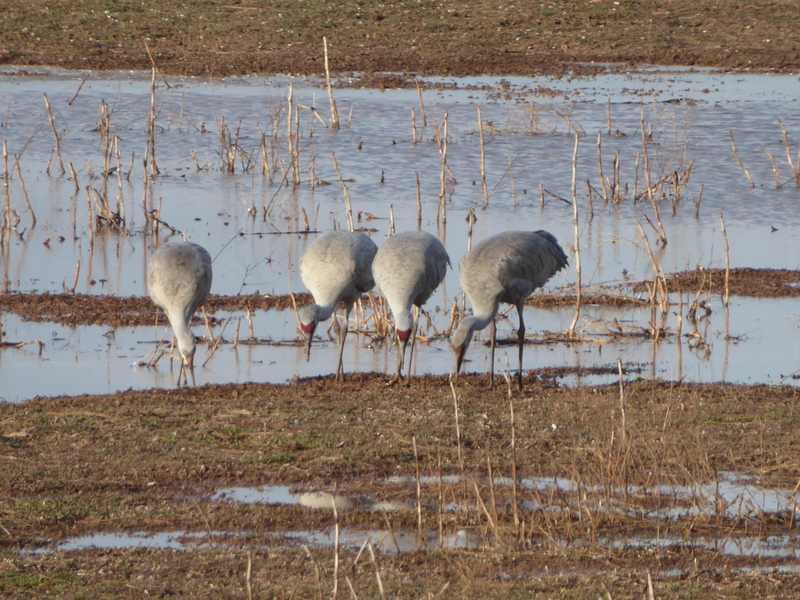 They return in the afternoon and evening. 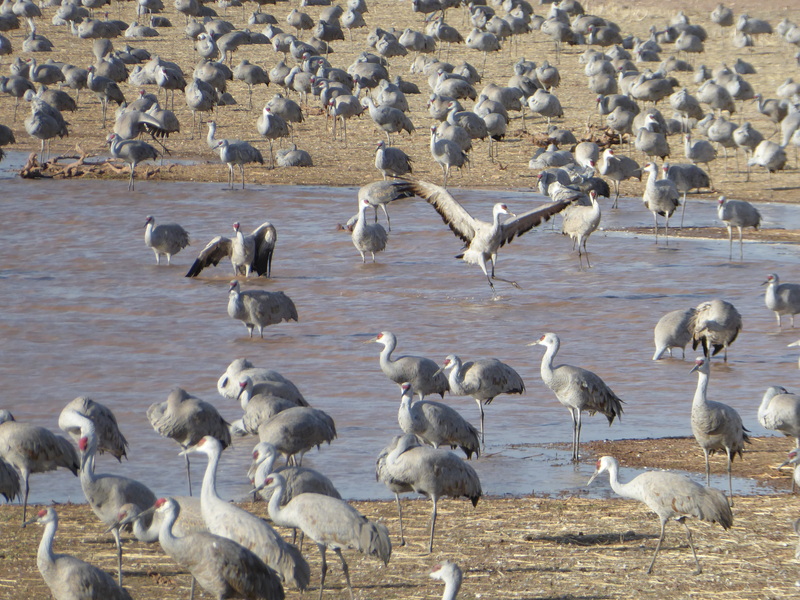 The fields were covered with several thousand birds – it was mesmerizing to hear and watch them! When the birds fly in and you can hear them before you can see them. 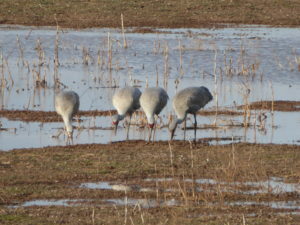 Here is a group of birds eating. The next day we took a day trip to Kartchner Caverns State Park. 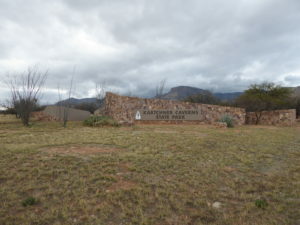 This is a park with one of the newest discoveries of a cave in 1974 by two local cavers. They kept the cave a secret for 14 years until they could find the best way to preserve it. It is a living, wet cave and the caverns are carved out of limestone. We toured the Rotunda room. The cave was quite beautiful, but we weren’t allowed to take any pictures. 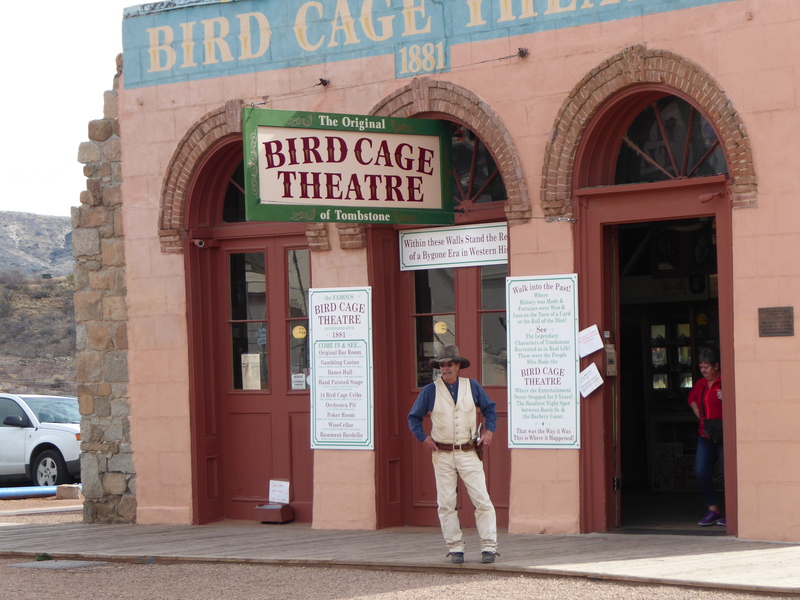 We weren’t even allowed to bring in a phone or camera – only wallets and keys! 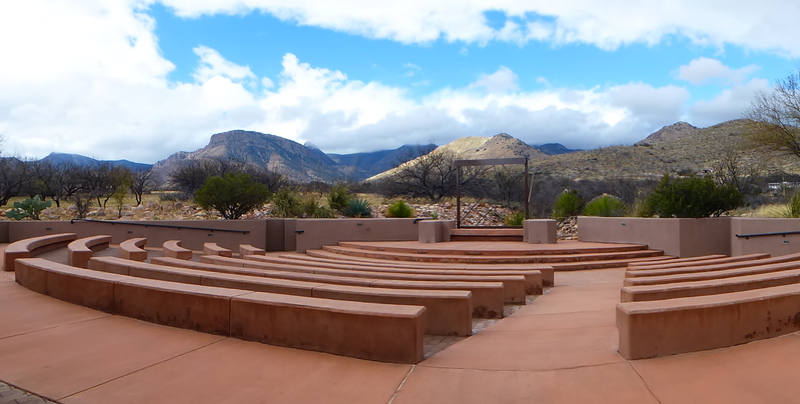 Here is a panoramic shot of the amphitheater with a lovely view of the mountains. 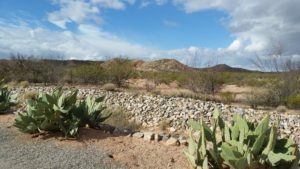 Our next stop will be Patagonia Lake State Park where we will meet up with our RVing women friends for one last get-together and then we will all part our own ways. Stay tuned! 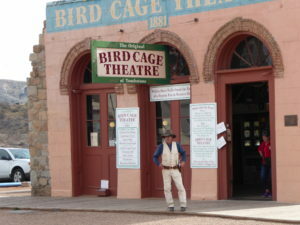 This entry was posted in Arizona and tagged Arizona-Sonora Desert Museum, Benson, Tombstone, Tuscon, Whitewater Draw. Bookmark the permalink. You are definitely following your dreams down a most interesting path…and taking us with you!!! We are having a great time! It’s amazing how many baby boomers are out here doing the same thing!